We plan on hitting all the events. And after FestiFools we will make our way over to FestiFeast, the traditional after-party dinner at the Aut Bar (315 Braun Ct., right across 4th Ave. from the Farmers’ Market). What happens if it rains Friday night? The good word is that FoolMoon will embrace the weather conditions. The event will go on rain or (moon)shine, and I find this “can do” attitude very refreshing, even Foolhardy (with emphasis on hardy). Some of the features may have to be tweaked and brought under shelter — I’m excited to see how it all plays out. Got any fish lanterns from last year? I hear those would love to come out and play in the rain. Clear plastic bags will be available to protect the lanterns from the elements. Stay in the Foolish loop! Barrie the Bookworm awaits final assembly. U-M student, and future elementary school teacher, Jordan Wylie worked with kids to create this 50′ bookworm to be unleashed at FestiFools on Sunday. Jordan chose the name “Barrie” after J.M. Barrie, the author of Peter Pan, which was her favorite story growing up. 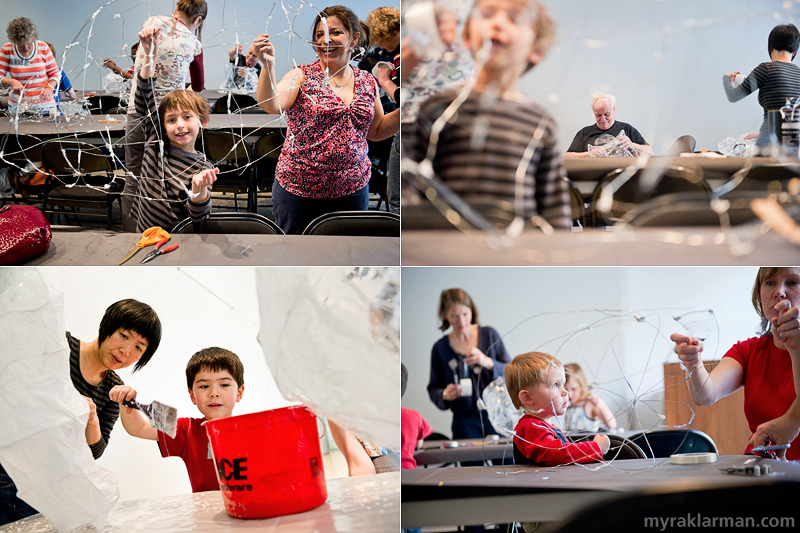 During two events (one at the Hands-On Museum; the other at the AADL), over 200 kids — yes, that said TWO HUNDRED KIDS! — helped paint Barrie’s body segments and legs. The families that helped make Barrie will get to “wrangle” him up and down Main St. during FestiFools. A rather photogenic array of tools lying about at the FestiFools studio. 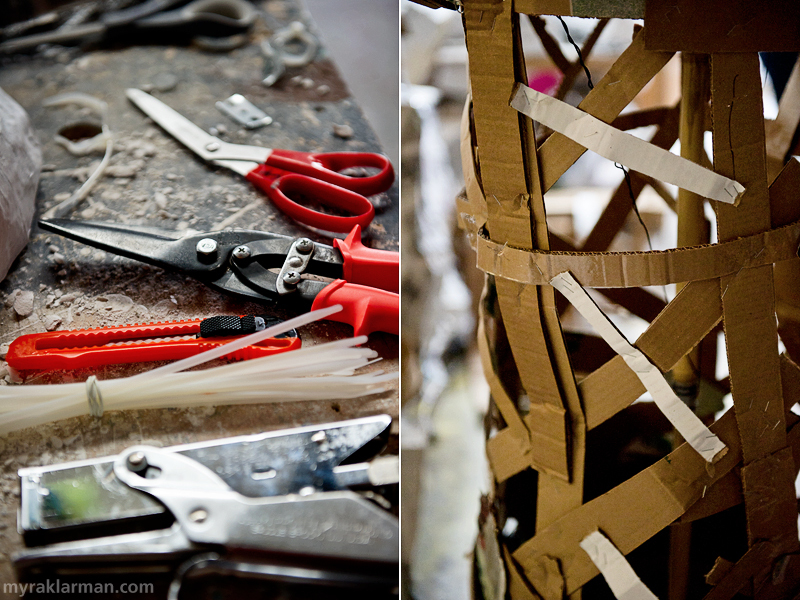 | The inner structure of many of the puppets is simply stapled, reused corrugated cardboard. 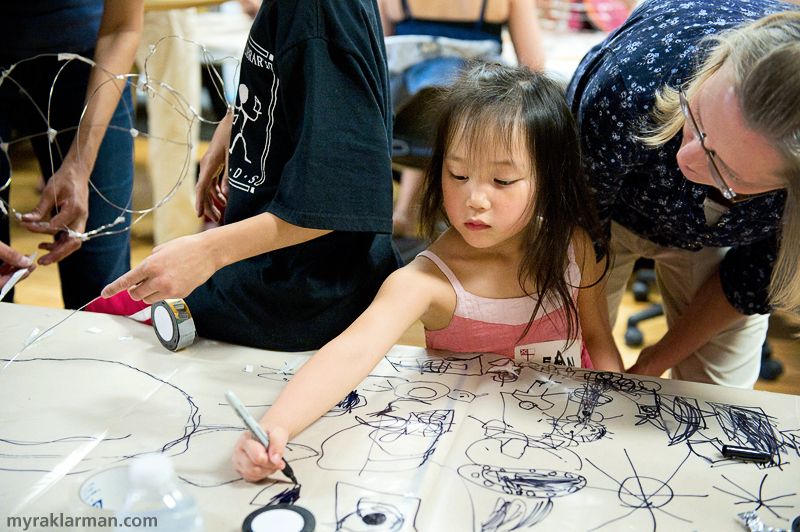 Sophia Michahelles and Alex Kahn of Superior Concept Monsters use a map of downtown Ann Arbor to demonstrate how the two groups of puppets will enter Main Street. A quick jaunt out to Ypsi to meet up with Claire Broderick and other stylists from Orbit Hair Design. 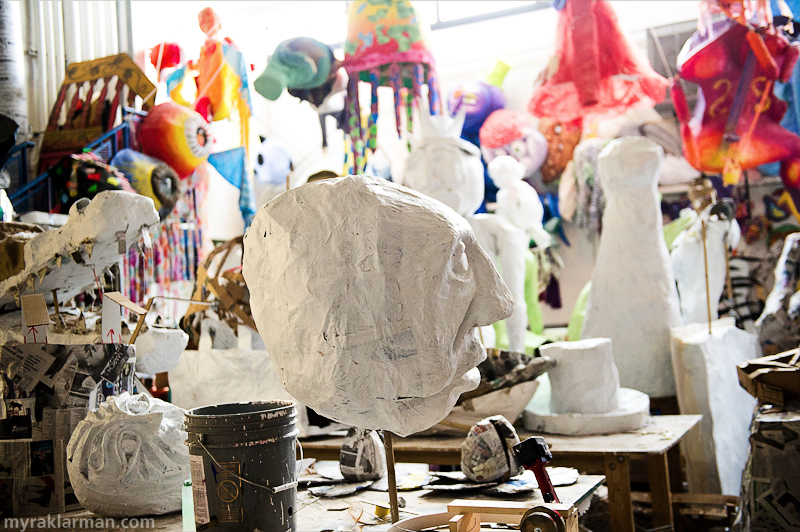 They are busy assembling fluorescent, outré hairpieces, which they will happily affix — gratis! — to the heads of those Fools who are game (just visit the Orbit tent at FoolMoon). 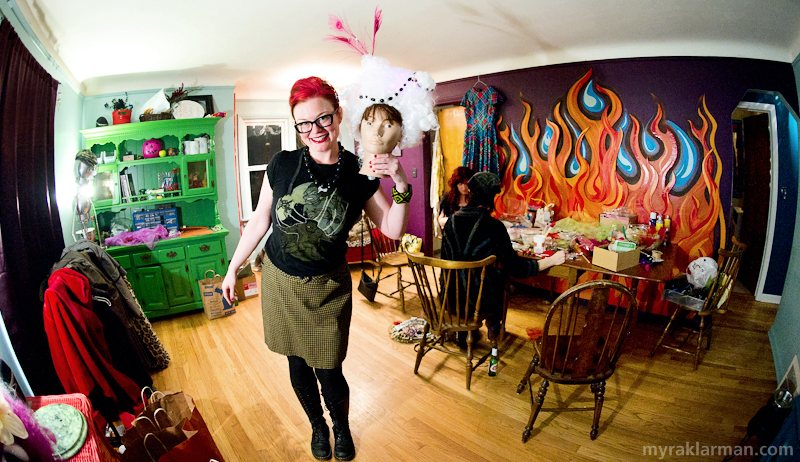 Here, Claire poses in her craft room with a wig of her own design. 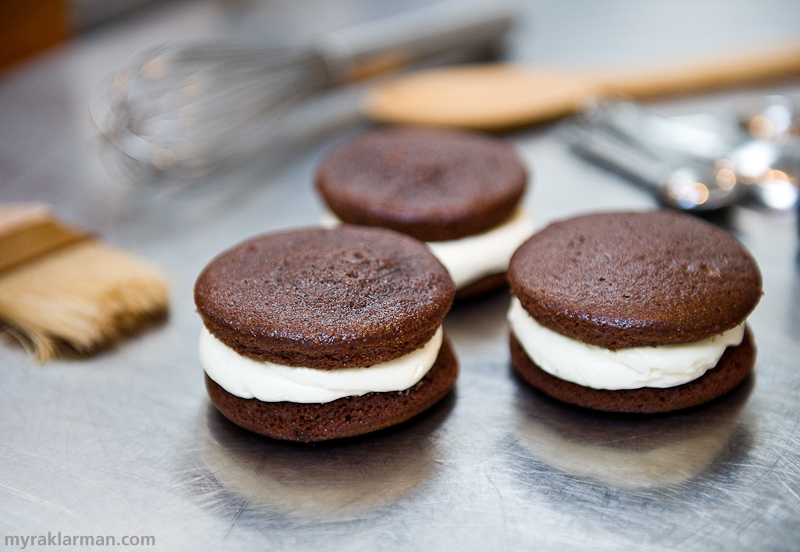 New this year for FoolMoon: MoonPies! Bryant Stuckey of Decadent Delight has whipped up just 300 of these Foolish delectables — with proceeds to benefit FestiFools! Run, do not walk, to get yours. While I was in Ypsilanti, I paid a quick visit to Patrick Elkins, who was in the middle of cutting a new stencil. Be on the lookout for his shadow-puppetry antics on the street during FoolMoon. 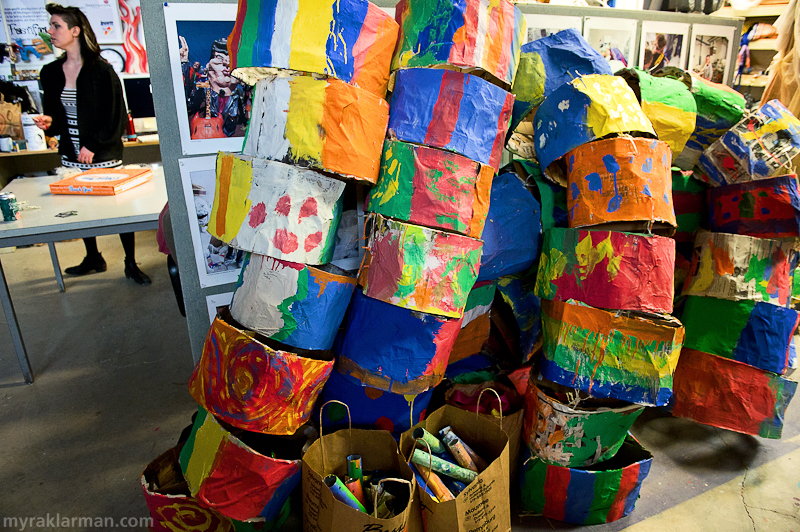 A group of Greenhills students volunteered at the FestiFools studio last week to build “MeterMoons,” which will cover 20-some-odd DDA parking meters and delineate the FoolMoon space. Luminary building at the free workshop held at the UMMA. All of the LED lights for this year’s FoolMoon luminaries were generously donated by Ace Barnes Hardware. 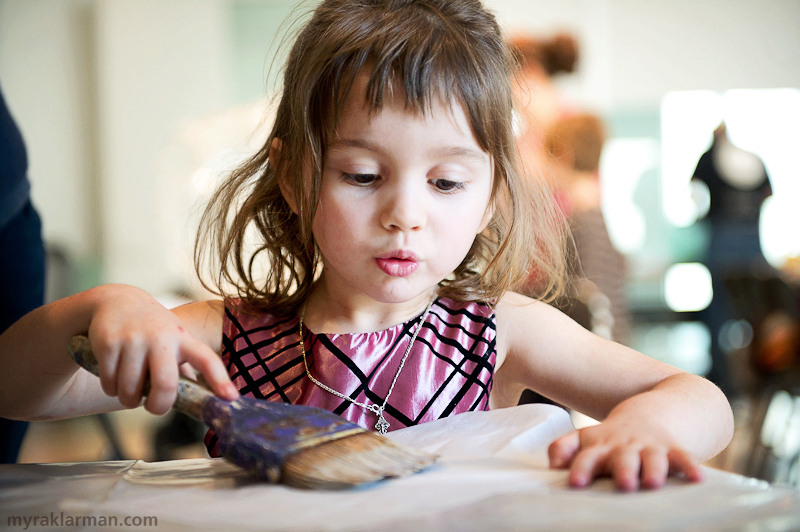 A young artist at one of the four luminary building workshops in March at Workantile. 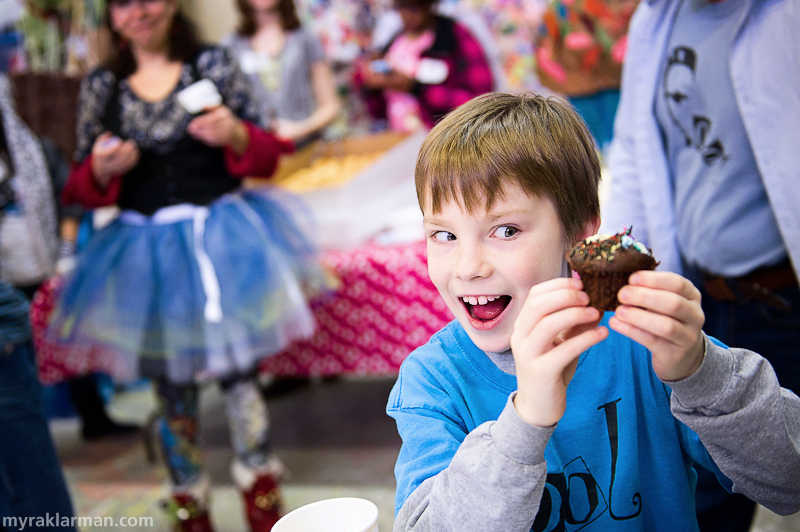 Once again the puppet-building season was initiated with a favorite, fun(d)raising event in February for donors and volunteers — only this year with a new twist: Puppets + Cupcakes! Fools of all sizes built shadow puppets, sculpted clay, and decorated their own cupcakes. Decadent Delight donated the criminally scrumptious cupcake fixin’s. Many of the same families return to this event year after year, and it’s so nice to see them again. 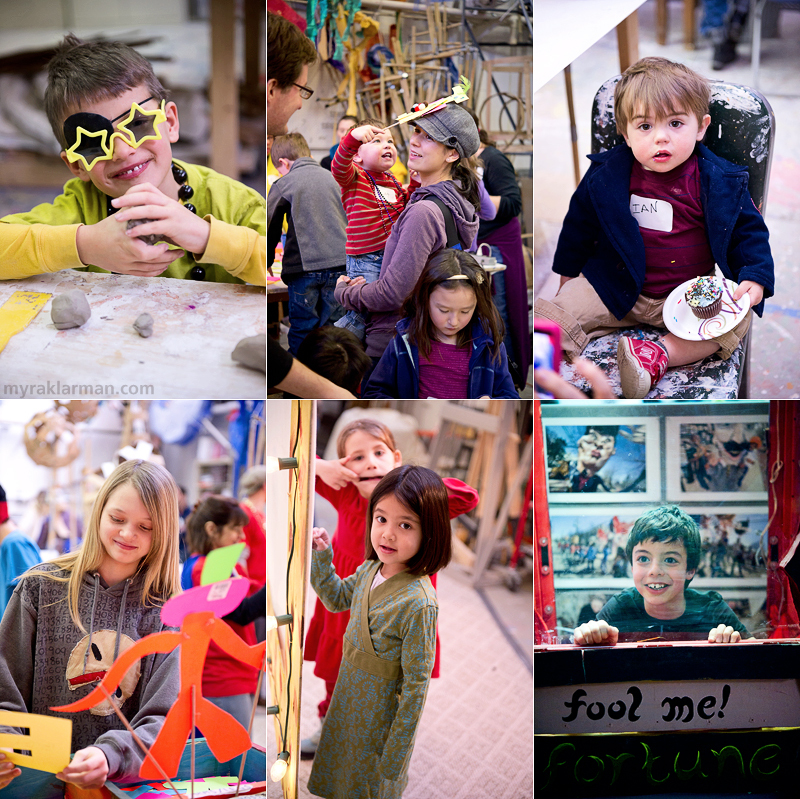 It’s like an indoor, mini-FestiFools event — a great opportunity to express your inner and outer Fool. Max (bottom right corner) loved playing the fortune teller. Hanging behind him are photos I took at the very first FestiFools event, back in 2007. 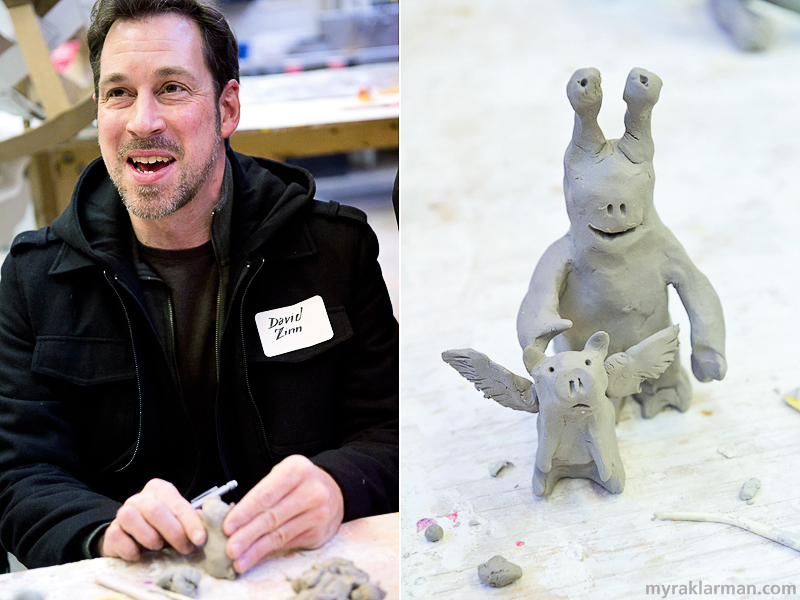 Artist David Zinn (of sidewalk-chalk-art fame) visited Puppets + Cupcakes. | David’s friends Sluggo and (unnamed) flying pig also came by. 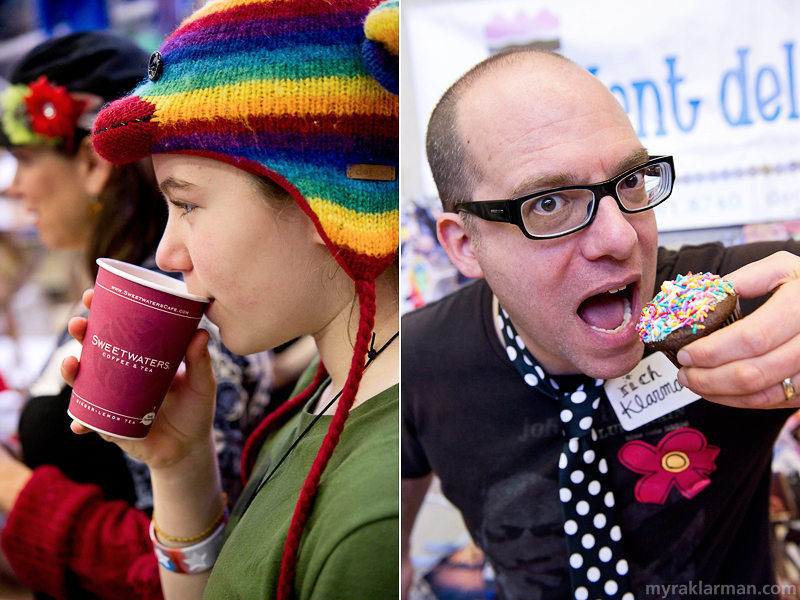 Thanks to Puppets + Cupcakes sponsors Sweetwaters Coffee & Tea and Decadent Delight. I hope to see you at one or more of the events this weekend. 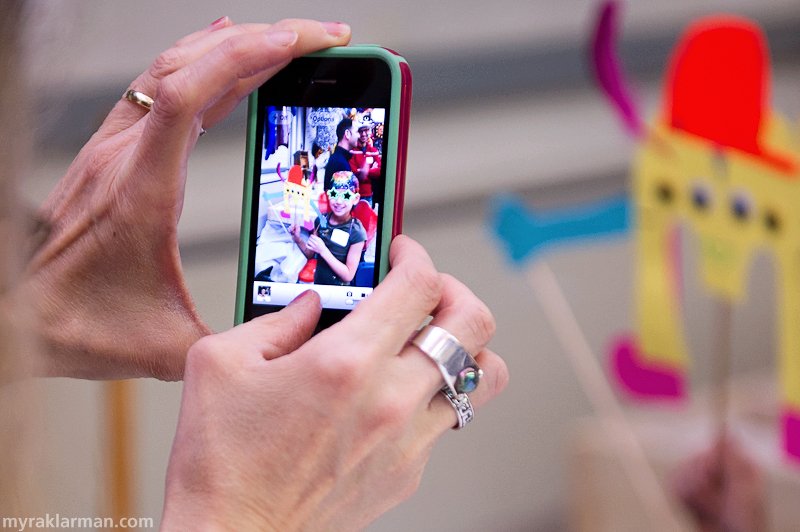 Don’t forget to bring your camera — any camera!